Acne is a common but complex, inflammatory skin disorder that affects at least 50 million American adults and adolescents, according to the American Academy of Dermatology. The inflammatory condition involves the oil glands of the skin, which become clogged with dead skin cells and excess oil, trapping bacteria in the pores. This triggers an inflammatory reaction and leads to the development of pimples, some of which contain pus. This pus can emit a foul odor due to the byproducts of bacteria feeding on skin oil. A type of bacteria called Propionibacterium acnes (P. acnes) normally lives deep in the oil-producing pores of the skin. P. acnes occupies this site because it feeds on skin oil, also known as sebum. People with acne typically have an overgrowth of P. acnes, likely due to excess sebum production. Those with acne also exhibit an exaggerated immune response to P. acnes, which leads to inflammation of the pores and an accumulation of white blood cells. The inflammatory response to the trapped bacteria along with an accumulation of sebum, dead skin cells and white blood cells within the pores leads to pus-filled pimples. 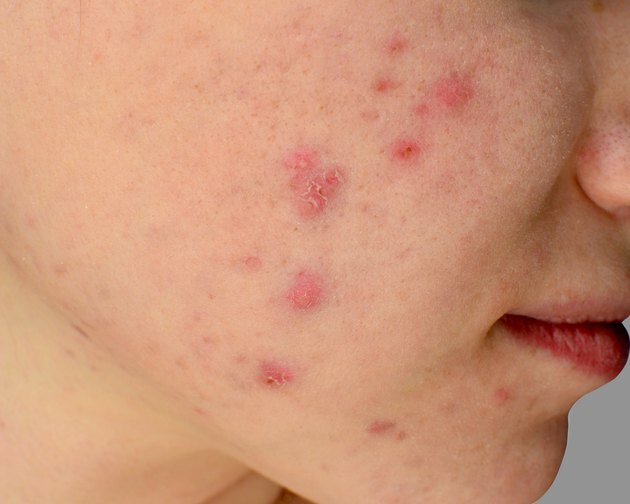 In people with moderate to severe acne, these pimples can grow into larger nodules or cysts. Many types of bacteria emit odors as they grow. These odors arise from byproducts produced as the bacteria feed on various substances. P. acnes possesses specialized enzymes that enable the bacteria to breakdown and feed on sebum. This breakdown leads to formation of propionic acid and chemicals called short-chain fatty acids. While sebum is odorless, the byproducts of P. acnes breakdown of skin oil emit an odor that has been described as rancid or sour-smelling, similar to body odor. When a small acne pimple breaks open and releases a minute amount of pus, it's unlikely you'll notice any odor. The amount of odor-emitting chemicals is typically too low to cause a noticeable odor. However, because larger acne nodules and cysts contain a greater volumes of pus and bacterial debris, you might briefly notice an odor when they drain. Gently washing away the pus with a mild skin cleanser and water will eliminate this temporary odor. Most recommended acne treatments either directly or indirectly reduce the overgrowth of P. acnes in the oil glands, thereby diminishing the likelihood of foul-smelling pus. Topical benzoyl peroxide products, for example, kill some of the P. acnes on the skin. These products are recommended, either alone or in combination with other acne treatments, by both the American Academy of Dermatology (AAD) and the American Academy of Pediatrics (AAP). Topical or oral antibiotic therapy also reduces the population of P. acnes and is recommended for some people with acne. Topical retinoids -- such as tretinoin (Retin-A), adapalene (Differin) and tazarotene (Tazorac) cream, gel or lotion -- do not possess antibacterial properties, but help reduce P. acnes overgrowth indirectly. Acne is not a life-threatening condition, but it can wreak havoc on your self-esteem and social life. See your doctor if you're living with persistent acne, especially if it is causing large pustules or cysts, which can lead to permanent scarring. Your doctor can assess your situation to determine whether you have acne or another skin condition that resembles acne, such as rosacea or folliculitis. If your doctor confirms a diagnosis of acne, she can then advise you about the best treatment options to manage your condition. Science of Acne: What is Propionibacterium acnes?